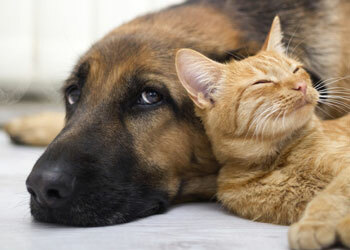 If your dog or cat is over 10 years old, he or she is at a greater risk of dying from cancer. The good news is that half of all incidents of cancers can be cured if caught early enough. Will my dog or cat get cancer? There’s no way to know for sure, but some dogs are more pre-disposed to it than others. Mixed-breed pets will likely have a better chance of avoiding cancer as they share a wider gene pool. Certain pure breeds are more likely to be pre-disposed to cancer like Golden Retrievers, Bernese Mountain dogs, Boxers and Flat-Coated Retrievers. Cats, on the other hand, are are less likely to have predispositions to cancer based on their breed. Only a licensed Veterinary doctor can diagnose your pet’s condition, but one course of treatment often used by Veterinarians is “Chlorambucil”. Chlorambucil is an immune system suppressing drug given to pets for immune-mediated disorders such as cancer including leukemia and lymphoma. It requires a prescription and can only be prescribed by a licensed Veterinarian. Call Global Rx Pharmacy today at: 949-528-6888 and one of our trained pharmacists will help you find a qualified Veterinarian in your area that can diagnose your loved pet. Get a consultation with a qualified and licensed veterinarian. Global Rx Pharmacy can help you find a qualified and helpful veterinarian near your home. If he or she determines the best course of action is pet cancer treatment with medication. He or she will likely provide you with a prescription to be filled by a compound pharmacy, like Global Rx Pharmacy. The pharmacists and team at Global Rx Pharmacy can help you find a qualified and licensed veterinarian in your area to provide you with a diagnosis and prescription, and can work directly with your veterinarian to expedite the creation and delivery of your prescription.